"Hark, the heavens proclaim'eth not!" Do petty hearts crumble or die in the dust? Tragedy to most hopeless romantics. Another crap wall i made today out of boredom, This is from the game Lineage2 but i have never played this online roleplaying RPG cos im broke and dont have time for PC games but all in all i chucked this out of DREAM's gallery because he has the mose intresting scans so you should check his gallery when your bored to wall something... But all in all the whole concepts was suppose to be a simple atmospheric wall for the most, added so much textures and experimntal colors around the wall. Had a hard time extracting the image but it turned out gritty and not so topnotch i think but i dont care... for the most part i made it look like an artpiece so dont brag about its quality!!!!! >_< then added a simple title.. and wala! So theres about 44 layers and 3 hours of work. More resolutions coming up for Imanimetions after Shinta puts the first few updates. Dude, there's more to life other than being in love and being loved. Glad some force knocked some sense into you. On the sidenote, I really hope that this goes into the top subs, owning those so-called top subs. You've renewed my love for elf women. Never have ears been so erotically depicted. whoa!! the scan is so beautiful!!! your interpretation of the bg is quite interesting. personally i would never have imagined changing the bg to that particular shade of blue. i would have been more inclined to use a "harder or darker" colour. but it looks really good- although im just not 100% sure if it blends with the yellow at top. the highlight for me is your use of grunge around the focal point [the girl]. i love it and it works insanely well. 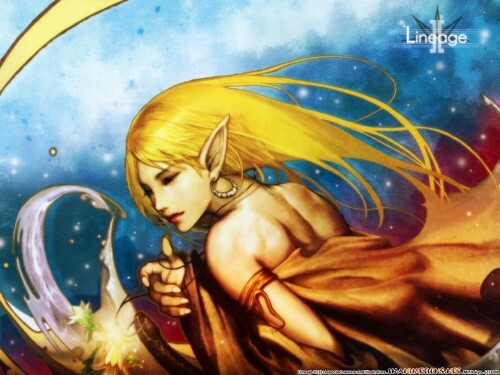 btw- that is my favorite painting from the Lineage II artbook. love the character and the bg.. they all fits well..
Nicely done wall although it's made up from boredom just like me as well. But I can say it's good wall. On a sidenote: Suicide ain't the best way to go. even thought of it once but never would do it. Life may be miserable but you still gotta live it and make the best of it. Wow. This is amazing. There's so much texture to it. Nice. Me like. ^^ +fave+ from me. what can i say, king of grunge.. xD it's a nice wallpaper. Recently i have been getting thoughts lately of suicide for some reaon unkown, maybe because im bored of it all.. you know life in general cos its like im one of those people who doesnt feel he amounts to both himself and life hes living for or just the fact im such a hopeless sad romantic who needs love intead of infatuations of a growing guy like me. But what the hell i just have to knock sense in myself like live on the edge just to live a lil... Like i use to do.. run from across roads when traffic is on go... hehhe i miss that. wow... *jar drop* wow...i really like this...the colours are great...but i you sure that blue goes will with yellow??? i mean the hair and the bg...but nice anyways!!! keep it up!! i'm not comlpetely sure what this picture ish.. =/ tha darkness in her eyes means its a sad event.. the lil green plant at tha btm shows hope in living.. the gold skin shows a richness in something.. i dont really understand this one.. I thought the wallpaper was a original scan at first i seen it..
Now, just like Whitey says, there's more to life other than those two. To tell the truth, it was him who dragged me out from my moral decadence (I was a wild girl, you know). He was my light. My saviour. So, don't you ever think of...suicide ever again. Or you'll make me sad and cry. suicidal thoughts...what da! !~ noooo I agree with White-zero...there's more to life other than being in love and being loved. X_x being alive should be happy..
the blue tone for the background and the redish orange tone for the char...contrasty. Im so busy o_o.. i wanna wall..
as for the wall..."woosh!" to the blending! awesome work... the scan feels really good and thoughtful as I look into it more but u also gave it strong emotions by using these colors.